I think we now know the reason behind the Chinese democracy delays..
She don't lie, she don't lie, she don't lie. How about producing a guitar like those beer hats, except the plastic tubing terminates with a nose plug... Keith Richards would approve! Is that a factory upgrade, like better pickups? The photoshopping may simply have been done by the newspaper to save paying for the brand logo on the cup. It's the same as blurring out the Nike swoosh. Has anyone noticed that this was a Squier and not a real Strat? No, anonymous, that's news to me. As far as the photoshopping being just to blur the cup logo... though that is definitely true in some cases... I dunno. The whole cup looks badly shopped in. As does that incredibly tiny Squire guitar with strange white edges... and possibly even the blue bag and the (guitar?) bag under the tiny little guitar. I don't think that guitar being cut open is a Squire. Having seen, and owned a black Squire strat, I can say that I've never seen a Squire with the pickup spacing fit to single coil pickups. It is more like a larger space cut out, if not just a big rectangle straight up and down, at least big enough to hold a humbucker. That and if you look at the cocaine guitar picture, the screw holes for a strat pick guard arn't there,and why are there six holes drilled for the strings? Strats don't use that kind of bridge. The story seems to be legit, the cup in the first photo is definitely a hoax though. I don´t think the newspaper did that, the logo on the cup belongs to a Costa Rican soccer team, my bet is followers of the rival team put the cup in the pic. "I don't think that guitar being cut open is a Squire...pickup spacing"
Also there's the 'being made out of solid cocaine wrapped in fiberglass' that hints it's not a real Squier. Meh...it's the prototype for the Fender Custom Shop Stevie Nicks Signature model. Albeit its illegal but yet unique. It's probably the pieces of many different guitars chopped up and re-asembled to resemble a strat. now where was that model guitar in the 80's? bag(s), guitar, and cup are all shopped in on that 1st picture. Perspective and size ratio is all wrong for the whole thing. I wonder if they sell those things in Turnkey? I once played on a gig in a prison. Out personal bags were completely checked, but out chevy van completely filled with amps, speakers, cable bags, instruments etc were not checked at all. We were flabb'd because we could have brought anything we would have liked into that prison. Amazing. Fortunately, we were honest guys, not planning anything and perhaps they saw that. But a weird feeling. 2.5 mil € of coke won't fit in a guitar body. That total came mostly from the coke dissolved in water he was carrying. It's about a 500K€ guitar. I always wondered why some Strats have such a refreshing sound. 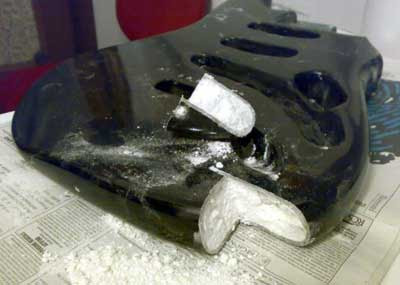 That was a clever but stupid idea of putting cocaine in a guitar, when it could leak out!!!! People would do anything for drugs these days WoW!